Justice League #20 is chock full of compelling ‘what if’s’ that round out a book filled with epicness, levity, and heart. When we last saw our heroes, they followed an older Superman, clad in white and gold, through a dimensional portal to meet a future Justice League that was successful in saving the universe. In the second part of “The Sixth Dimension,” the tapestry of the saga that is being woven by Scott Snyder and Jorge Jimenez is expanded even further. It showcases versions of heroes so unique that they are deserving of their own series. It shows a universe in which everything is paradisal, or at least being reconstructed that way. However, as it goes in classic comic book fashion, all might not be as sublime as it seems. Since taking on the reins of Justice League last year, Scott Snyder has written a story with that has introduced a number of massive concepts that rewrite the past and present of the DC Universe. 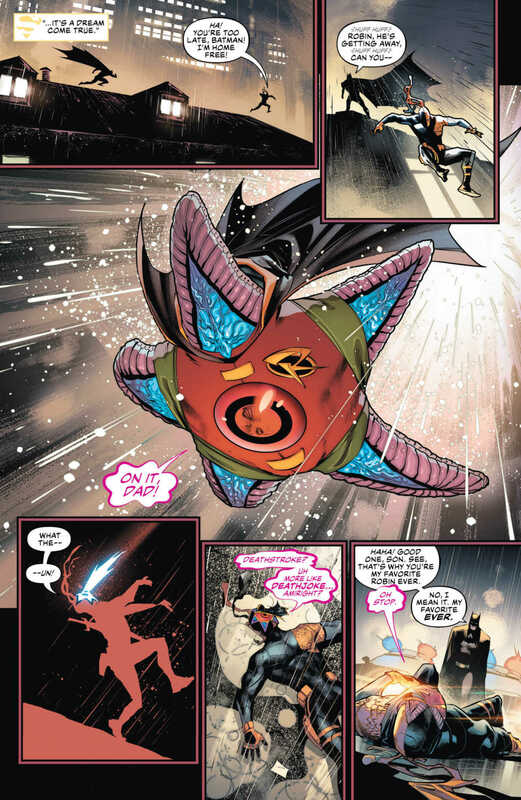 In Justice League #20, Snyder teases readers with a new take on its future. Readers are shown a crime-free Gotham City, a Mars repopulated, and a universal language. Some of the notions that Snyder presents is overwhelming, and it is difficult to see where he will go from here. But he has already proven himself a master storyteller and world-builder, and will no doubt keep readers engaged. The grandiose vision of the future that is presented in this latest issue of Justice League is not without its moments of humor and heart. One of the most talked about moments in this issue will no doubt be Jarro and his dream as a new Boy Wonder. Scott Snyder has written a truly gratifying comic book with breadth, and captivating characters. Though this version of the future is undeniably too good to be true, the universe within Justice League #20 is imaginative and vast. What can be said about Jorge Jimenez that hasn’t been already? His illustrations are consistently first-rate out of this world. From the breathtaking scenery of Blackhawk Island and Gotham City, to incredible character designs of the sixth dimension Superman and Flash(es), the work of Jimenez shines in Justice League #20. Another epic and extensive spread featuring Perpetua stands out, much like in the previous issue. You won’t see any explosions or actions scenes. However, you will be blown away by the look of the frenetic characters and intricate architecture. Alejandro Sanchez’s use of color compliments Jimenez’s artwork. The glowing whites featured in old man Superman and New Gotham are and full of life. 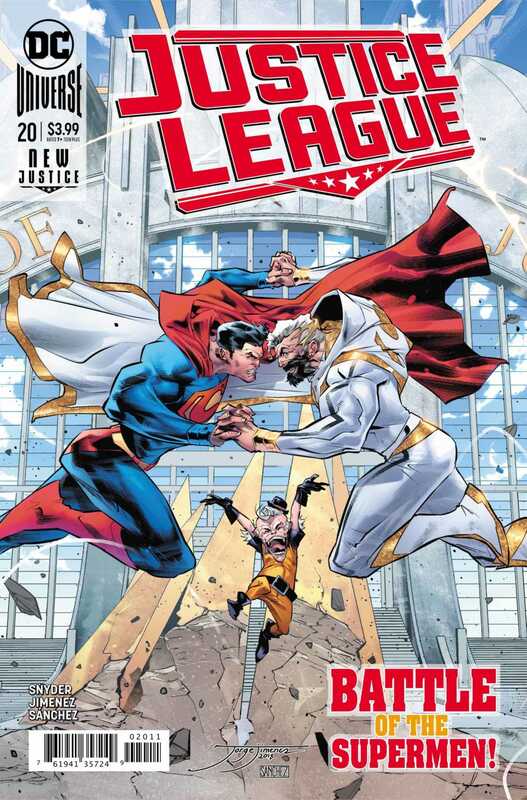 Sanchez makes Justice League #20 a gorgeous read with a diverse palette used in every panel. Tom Napolitano’s lettering cleverly uses different effects, particularly for Jarro and the merged Flash, impressively helping to diversify the dialogue. A bold step forward in the quest to save the DC Universe, Justice League #20 is a masterclass in storytelling, world-building, and artwork. 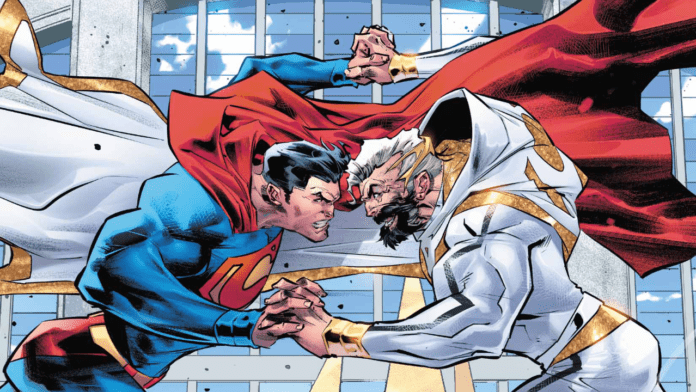 What did you think of Justice League #20? Let us know in the comments! Michael E. Fromm is an all-around scrivener, writing screenplays (short and feature), short stories, novels, poetry, blogs, articles, and press releases. Since first learning to hold a pen, he has done little but read, watch, and write about characters and worlds of fantasy. It would be very difficult to find him without a pen in hand and an idea in mind, which is problematic for anyone wanting to have a conversation with him. Michael graduated from Rowan University, primarily focusing on improving his skills as a filmmaker and screenwriter. After said schooling, he joined an elite force of Rowan grads who also had the notion of becoming filmmakers. This group, known as Justice Productions, call on him every so often to write short films. And, until this whole writing thing pays off, Michael currently does development & marketing communication (writing, graphic & publication design, social media and website upkeep, etc.) for a web development company in Central New Jersey, where he currently resides.